This year we were late leaving Arizona and in a hurry to reach Mazatlán to meet Terri's brother who was fliying in. We drove the entire distance on Mex 15 from Nogales to Mazatlán, a distance of 775 miles (1,247 km) as we drove it, in a little over two days. Our overnight stops were at Punta Vista RV Park just south of Magdalena and at El Mirador Restaurant and RV Park in Huatabampito. 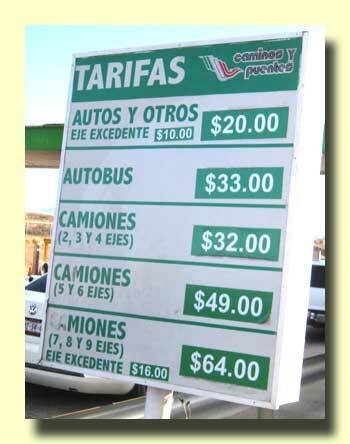 Because the trip was done in a hurry we went through all of the toll booths except the one south of Navajoa. 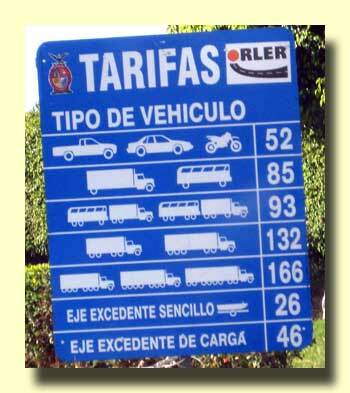 The pictures below show all of the toll rates in effect during this trip. It is possible to bypass all except one of the toll booths along this route by following sometimes circuatous routes. Elsewhere on this website are some driving logs of this route that we wrote in prior years. Here are the logs from Fall 2006. That year we bypassed all tolls except the Nogales Bypass, Caseta Hermosillo, Caseta Puente San Miguel, and the Caseta Puente Sinaloa. Here are the logs from Fall 2009. Note that they include maps. 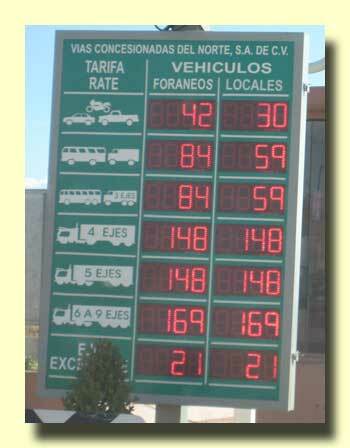 That year we bypassed some additional tolls including Caseta Hermosillo and Caseta Puente San Miguel. When following these logs it is important to be aware that conditions change from year to year and some routes, particularly the bypasses, may not be passable. We crossed the border at the Mariposa crossing just west of Nogales. 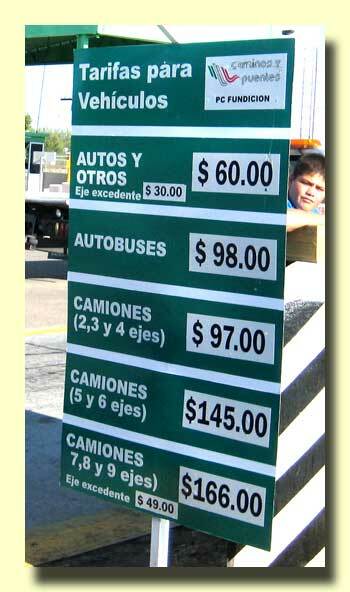 One change from prior years is a checkpoint on the US side of the border. This checkpoint is designed to stop the flow of guns and drug money into Mexico. There was no line and the stop didn't take long. The stop at the Km 21 checkpoint was uncrowded. We were directed to park in the far left section. The reason for this is that the window holograms now have an embedded chip that is read automatically as you pass the small booth on the left just before exiting the parking lot. 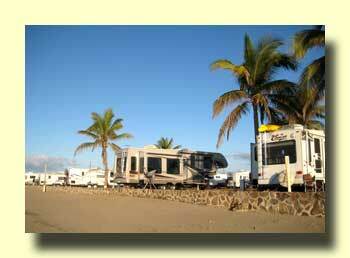 The Punta Vista RV Park is not far south of the toll booth, we spent the night there with two other rigs. With an 8:30 AM start we weren't the first ones out the gate. A huge fifth-wheel toy hauler beat us out, we didn't see them again until Mazatlán. 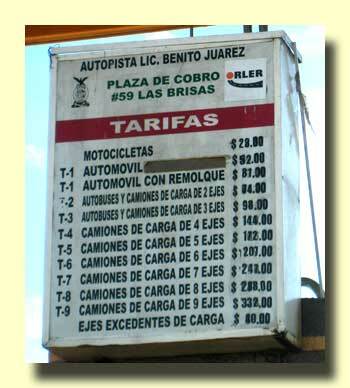 The drive through the streets of Hermosillo was busy but trouble free. 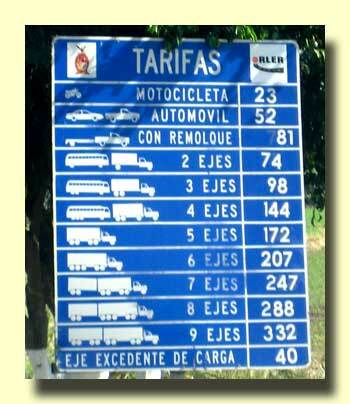 Then we were on the good highway south to Guaymas. 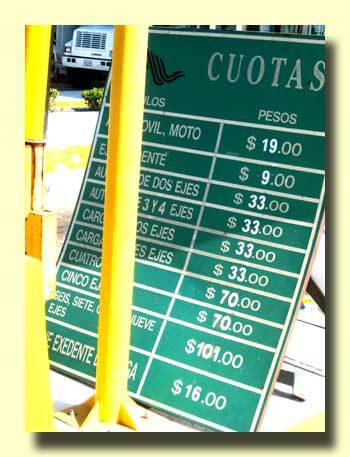 As you enter Ciudad Obregon watch for the sign near the Wal-Mart that directs heavy traffic to the left. The parallels the route for light traffic through town. Take it or ticket! 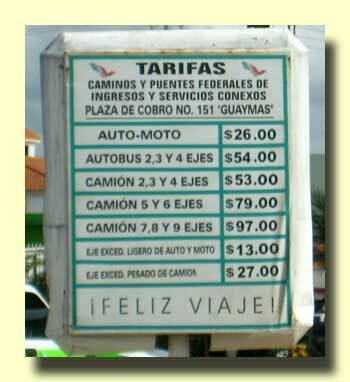 Navajoa too has a heavy traffic route that is just east of the main route through town. Again watch for the sign as you enter town. They're issueing tickets to scoff-laws too. From Navajoa we followed the direct route to Huatabampo and then on to Huatabampito. 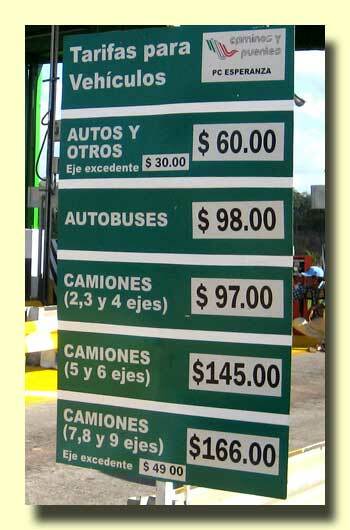 That means we missed a toll booth south of Navajoa and don't have a picture of it. However, it is called Caseta Estación Don and is at 26.84978 N, 109.37341 W. Driving direct it's 41 miles (66 km) south of Caseta Fundición. 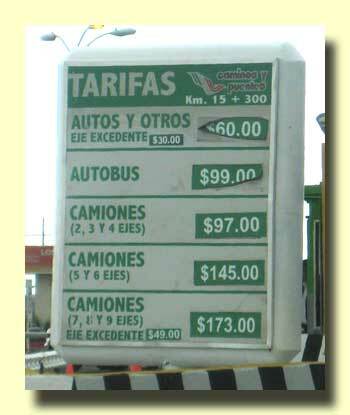 Rates at Estación Don are usually almost the same as those at Caseta Fundición. After a great evening at the El Mirador (with beach walk and shrimp dinner) we were again out of the park way too early, about 8:00 am. Finding that there was plenty of time before dark we opted for the free road rather than the Maxipista between Culiacán and Mazatlán. The road is in good shape with no major construction. The first 10 miles (16 km) have been four-laned, the rest is mostly unchanged from prior years. Just before dark we pulled into the California RV Park in Mazatlán. Lots of room, but four days later every site was full. Other parks in town still had plenty of room.